Hanisha Patel serves as Vice President/Market Leader of the South Tampa Office of Pilot Bank, a Tampa Bay Area community bank that specializes in delivering personalized financial business services. Hanisha is passionate about exceeding the expectations of her clients, recognizing that her clients have huge demands on their time. She and her team, through attention to detail and a can-do attitude, work diligently to become an indispensable asset to those clients. In an era where most commercial banks are focused on the bottom line, Hanisha understands the importance of personal relationships and inspires her team members to understand the same. Using her proven leadership and commitment, she has developed a team that enables and supports business owners to manage their firm’s cash flow and capital expansion that ensures long-term steady growth. This strategy also serves to minimize long-term debt with financial products and services uniquely suited to each client’s business. 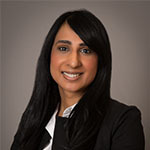 Chronicling over 12 years of experience in the commercial banking industry, Hanisha has obtained advanced degrees in Business Law and e-Commerce and is well positioned to help any Tampa Bay business owner promote the growth of their business. Hanisha’s most memorable life events include her marriage and the birth of her daughter; an amazing journey to South East Asia; and moving to the United States to begin her professional career. She is actively involved with The Tampa Rotary, The Greater Tampa Chamber of Commerce, The South Tampa Chamber of Commerce, and the Working Women of Tampa Bay. She grew up in London, England and has lived in Florida since 2004.